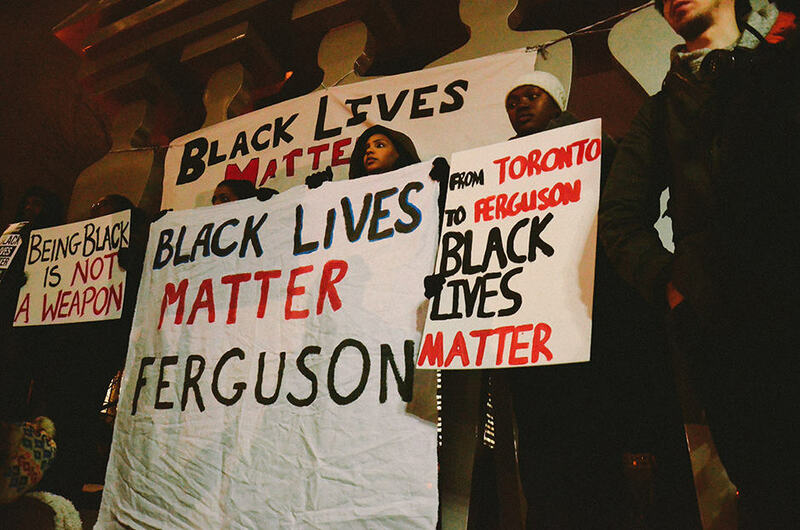 On November 25, University of Toronto students joined in a rally at the American Consulate in Toronto to stop police brutality against black people. The rally stemmed from a St. Louis County grand jury decision not to indict Ferguson police officer Darren Wilson for killing Michael Brown, an unarmed black teenager. For Zakerie Farah, a first-year student, the rally evoked many emotions. “This was a strong symbolic moment of black unity and strength. I was touched by it,” Farah says. Event organizers hope that the rally will help launch solidarity efforts to support organizers on the streets of Ferguson, as well as to recognize racially-motivated police brutality in other areas of the world. Yolen Bollo-Kamara, University of Toronto Students’ Union (UTSU) president and one of the organizers of the Toronto rally, drew connections between the deaths of Brown and Jermaine Carby, a black man who was shot and killed by a police officer during a traffic stop in Brampton on September 25. Bollo-Kamara expressed hope that the rally would play a role in ending racial profiling in Toronto and ensuring that police forces are held accountable for their actions. Bollo-Kamara also notes that rising tutition fees make post-secondary education unattainable for many low-income families, with black and otherwise racialized families disproportionately affected. For M’kaylah Fridal, president of U of T’s Black Students Association, racial profiling hits close to home. “My father, my brother, uncles, cousins, and numerous friends all have been subject to racial profiling at least once,” Fridal says. Fridal also referenced the lack of university professors from racialized backgrounds. She recalled one particular instance where her 14-year-old brother was stopped by a police officer during his walk home from school and questioned about his activities and destination. “The reality is that things like this happen every day — not merely for some, but for many,” Fridal says. The Arts & Science Students’ Union also expressed concern over the grand jury’s decision. “Acts of police violence towards First Nations people and people of colour occur all the time with a hugely disproportionate amount of violence being directed at black youth. For hundreds of students at U of T, this is the reality they face when they go back to their homes and communities,” a statement reads. *First name used at student’s request.